Protesters block streets in St. Louis, Missouri, after the announcement that a grand jury decided not to indict Ferguson police officer Darren Wilson in the shooting death of 18-year-old Michael Brown. A St. Louis County grand jury decided Monday that police officer Darren Wilson will not face trial for shooting and killing unarmed teenager Michael Brown in Ferguson, Missouri. Grand juries usually return indictments; the one exception is cases involving police shootings. But more than that, police shootings, and allegations of police misconduct in general, almost never make it in front of a grand jury. 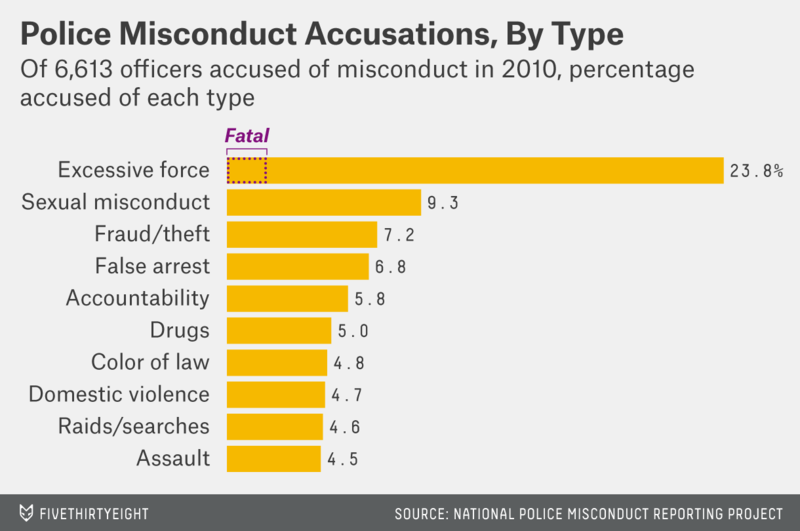 And officers rarely face legal consequences for allegations of misconduct. As is the case with police shooting statistics, comprehensive numbers on accusations of police misconduct are hard to come by. There is no national reporting requirement for such accusations; in fact, many places have laws to purposefully keep the details of misconduct investigations out of the public eye. Of the 71 arrests for murder and nonnegligent manslaughter, just 31 came when officers were on duty. That’s about four a year during the study period. As a reminder, the best-available evidence from the Killed By Police Facebook page points to about 1,000 deaths each year caused by officers acting in the line of duty. More general numbers on police misconduct come from National Police Misconduct Reporting Project (NPMRP), which collects data based on credible media reports (see its feed here). It was established by researcher David Packman in 2009, and operation of the database was transferred to the Cato Institute in spring 2012. Although the NPMRP continues to collect incidents, the most comprehensive and cataloged data comes from Packman’s original work. His key findings are largely laid out in a 2010 report. 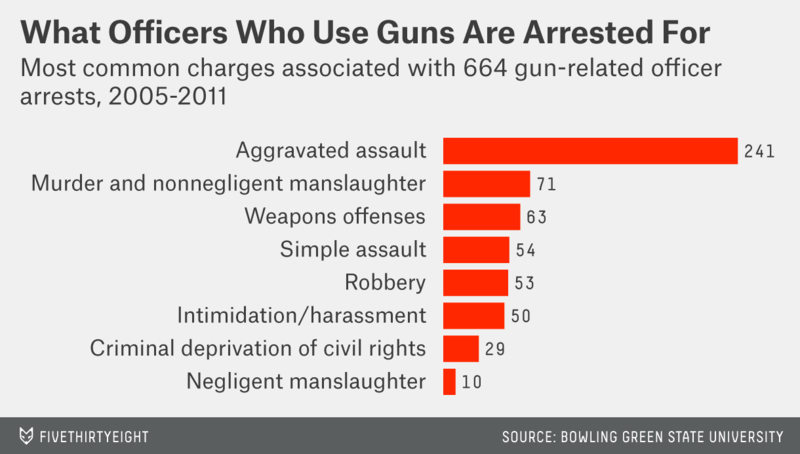 Excessive force was by far the most common type of accusation, and 15 percent involved firearms. There were 127 excessive force incidents reported that resulted in fatalities, and the majority of these (71 percent) were shootings. But, as was the case with Darren Wilson, most accusations of misconduct — combining all categories — did not result in criminal charges. Of the more than 8,300 misconduct accusations (involving almost 11,000 officers) in Packman’s database from April 2009 through the end of 2010, 3,238 resulted in legal action. 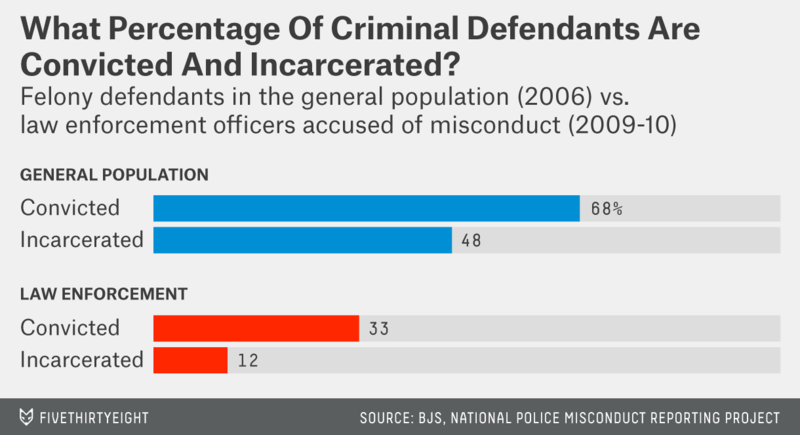 The chart below outlines how often these charges resulted in convictions and incarcerations, compared with the rates for felony defendants in the general population (in the 75 largest U.S. counties) collected by the Bureau of Justice Statistics in 2006. These numbers are now irrelevant to Wilson. Outside of the unlikely event that federal charges are pressed, his chance of being convicted and incarcerated for Brown’s death is almost zero.